Satin Nickel 3.5" X 3.5" residential interior hinges by Complete Home Hardware are a clean and modern look for your home's interior design. They match perfectly with today's trend of stainless steel appliances and industrial decor in the kitchen and throughout the rest of your home. Offered in 5/8", 1/4" radius corner and square corner. Be sure you are ordering the door hinge needed for application. 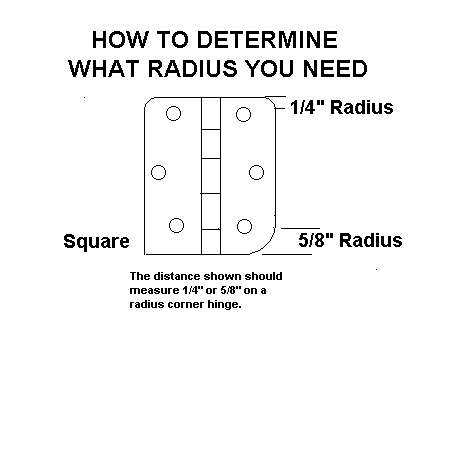 Take a look at the Complete Home hardware hinge chart below. If you still have questions, please don't hesitate to give us a call.